No dramatic surprises are found in the latest ranking of programming languages by IEEE, which reported that Go is leading the ascending trend of Big Data-related languages that dominate the findings. 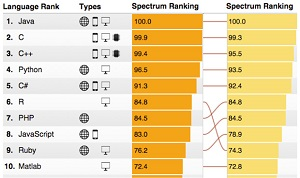 Now in its third year, the IEEE evaluation can begin to identify trends over time, the technical professional organization said in its IEEE Spectrum magazine and Web site about the new report: "The 2016 Top Programming Languages." Participating data journalist and Ph.D academician Nicholas Diakopoulos focused on languages commonly used for Big Data analytics, which are becoming more important in today's deluge of collected data, he said in a post Tuesday. "The biggest mover in this category was Go, an open source language created by Google to help solve the company's issues with scaling systems and concurrent programming back in 2007," Diakopoulos said. "In the default Spectrum ranking, it's moved up 10 positions since 2014 to settle into 10th place this year." 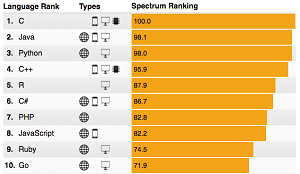 Note that the "default Spectrum ranking" was designed to reflect the interests of IEEE members. The organization boasts some 420,000 members and is known for publishing technical literature about electrical engineering, computer science and electronics (the association's full legal name is reportedly still Institute of Electrical and Electronics Engineers). The ranking in question is termed the "default" because, unlike other organizations that mostly publish static evaluations of the popularity of programming languages, IEEE provides an interactive tool that lets users investigate the metrics with different weightings (IEEE Spectrum default, Trending, Jobs, Open [open source hubs] and Custom) and filtered categories (Web, Mobile, Enterprise and Embedded). There are 12 of those metrics, coming from 10 different sources (read all about it here). The open source code repository GitHub is one source of metrics, and Diakopoulos said GitHub activity is the main reason for Go's ascendance, along with activity on the Reddit news and information site, which features a programming category. Google's open source Go language (sometimes referred to as Golang) also featured prominently in a ranking published in May by PayScale Inc. and Millennial Branding, which said "Scala and Go are the emerging skills with the biggest pay boosts." 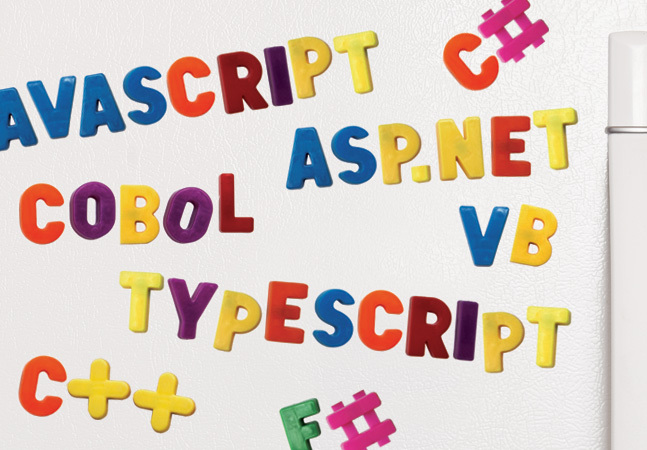 Along with Go, other languages such as Julia, R, Scala and Python "are riding the number-crunching wave," Diakopoulos said about Tuesday's IEEE report. "Other big-data languages that saw moves since 2014 in the Spectrum ranking were R and Scala, with R ascending 4 spots and Scala moving up 2 (although down from 2015, when it was up 4 places from its 2014 position)," he said. "Julia was added to the list of languages we track in 2015, and in the past year it's moved from rank 40 to 33, still a marginal player but clearly possessing some momentum in its growth." 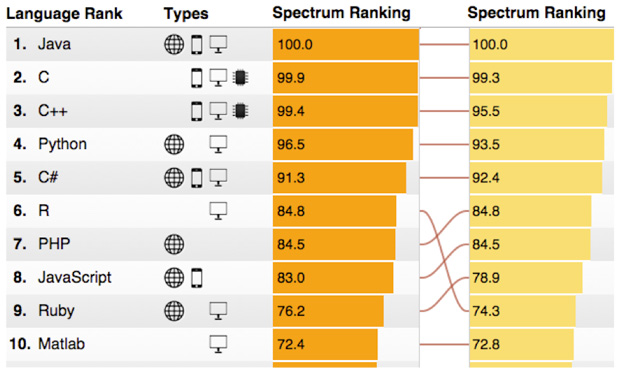 Note that last year's IEEE ranking also prominently featured Big Data in general and the R language specifically. "The big mover is R, a statistical computing language that's handy for analyzing and visualizing Big Data, which comes in at sixth place," IEEE Spectrum editor Stephen Cass reported in 2015. "Last year it was in ninth place, and its move reflects the growing importance of Big Data to a number of fields." Disregarding the Big Data angle, the overall ranking (reflecting all unfiltered use cases: Web, mobile, enterprise and embedded) shows the venerable C language leading all weighted rankings except for Open, where it falls to third place behind C++ and Python. Along with Java, those languages dominate most slices and dices of the IEEE data. "After two years in second place, C has finally edged out Java for the top spot," Cass said in his own post on the top 2016 languages. 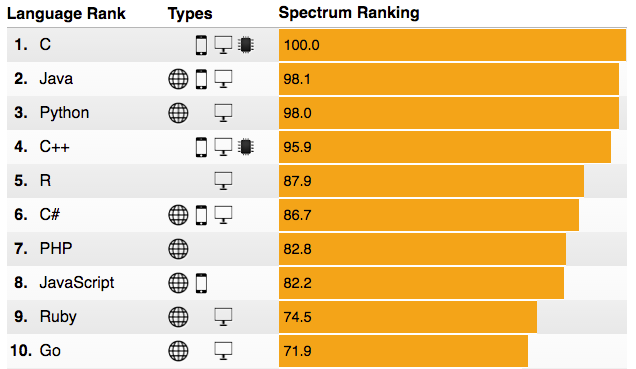 "Staying in the top five, Python has swapped places with C++ to take the No. 3 position, and C# has fallen out of the top five to be replaced with R. R is following its momentum from previous years, as part of a positive trend in general for modern big-data languages that Diakopoulos analyses in more detail here." "Google and Apple are also making their presence felt, with Google's Go just beating out Apple's Swift for inclusion in the Top Ten," Cass continued. "Still, Swift's rise is impressive, as it's jumped five positions to 11th place since last year, when it first entered the rankings. Several other languages also debuted last year, a marked difference from this year, with no new languages entering the rankings." One interesting finding details the slide of Shell programming in the rankings, in direct contrast to another recent report that surprisingly found Bash scripting skills provide the biggest monetary payoff. "On the losing side, perhaps the most surprising is that Shell programming -- a catchall term for the creation of scripts of the sort beloved by system administrators, using shells such as bash -- has declined in popularity, falling seven positions to 19th place," Cass said. "This may reflect the development of more sophisticated systems to manage cloud-based data centers, but we'll have to wait to see if the trend continues next year or if this is just a statistical fluke." Til next year, then, stay tuned.